I have another Zoya throwback to show you this week. It's hard for me in summer and spring time not to get a little bright and pastel overload. I love bright colors for summer, but sometimes you just need to wear something a little different. This fall color helped me clean my bright/pastel palette for a little bit. Kym is a sparkling red with an antique copper base and gold, copper and pink reflective metallic sparkles. Color: I like red polishes probably more than most. 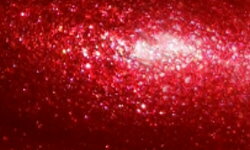 I love this red because it does have a little variation to it than your traditional red shimmer. This has a nice rusty warm tone to it that I really like. I love how glowy this polish is too. Formula: Nice easy to use formula. I used 2 coats above. Price: This is $9 on the Zoya website. Overall: Beautiful sparkling red for fall. I love richness and glowing quality of Kym. The color is great and it applies nicely. No, it may not be the most exciting color, but it's a great all-around color. I love the shimmery red Zoyas! Such a pretty red! I love these shimmers, and I agree, this has a nice rusty red edge that keeps it a little different!